Luxury holiday specialists True Luxury Travel have launched a brand-new European offering for 2019, and some of their snow-capped winter escapes makes for the perfect Valentine’s getaway this February. Romantic treats for your love this Valentine’s could include staying at the Ice Hotel in Sweden, sailing on the Norwegian Fjords, or enjoying a husky safari in Finland. Every trip is uniquely tailored to the individual, meaning every single romantic traveller can arrange a trip perfect for their loved one, built on their own passions and requirements. True Luxury Travel are known for their expertly-crafted, super luxurious offerings, and while they made their name as luxury Africa specialists, the dedicated operators are now extending the True Luxury Travel experience to new locations around the globe – including Asia and Europe. Every True Luxury Travel experience is 100% unique, just like your love, meaning you can tailor-make the perfect romantic break for your beau this Valentine’s Day. If you need a little inspiration to get started the expert travel team have put together a selection of the perfect romantic escapes to say ‘I love you’ this Valentine’s Day. Sweden only caught on to Valentine’s Day traditions in the 1960s, but that hasn’t stopped the celebrations taking off ever since, and who can deny the romance of the wintry Swedish landscape. For an extra-special romantic experience this Valentine’s, take your sweetheart on a trip out into the wilderness, where your chances of dancing under the northern lights are increased exponentially. Indeed, northern Sweden is possibly the best place to see the northern lights because it lies directly under the auroral oval, and enjoys clear skies more often that many other regions under the oval. Land on the runway in the Arctic Circle to be greeted by a pack of excited huskies, ready and waiting to whisk you from the landing strip to Fiellborg Lodge – only accessible via husky sled or snowmobile. Set out in the wilderness where the sun barely rises during the winter months, it is the perfect blend of isolated and luxurious. With no rhyme or reason to the phenomenon, True Luxury Travel can fill your days with a range of outdoor experiences for an unforgettable time in winter wonderland. Include a stay in the Ice Hotel, which was recently featured on TIME Magazine’s “2018 World’s Greatest Places” and is the world’s first hotel made of ice and snow. Price from £3,600pp including one night in the Ice Hotel and two nights in Fiellborg Lodge. Find out more here. The beautiful location of Norway is perfect for Valentine’s Day: from the steep mountain ranges to the still, deep lakes, it is both isolated and romantic. The fjords of western Norway were granted World Heritage status by UNESCO in 2005, and one look at any of the thousand fjords across the country is enough to see why. Each one is picture perfect, with majestic waterfalls and stunning scenery. The fjords are known for scenic driving, but they’re best seen from the water. With the mountains as your backdrop, True Luxury Travel can arrange day trips sailing between hotels to beat the traffic and experience the fjords from a different angle. Set off from Alesund and down Hjorundfjord and take in traditional fjord life along the way, witnessing fjord farming and glaciers in the distance. Stay in the Lyngen Lodge in northern Norway, a luxury boutique lodge offering full board en-suite facilities, world class cuisine, and countless activities – including sailing on the fjords. Here, you and your lover are likely to see the magical northern lights reflecting off the water of the fjords – arguably the most beautiful way to see them. For an extra special treat for your special someone, you can also arrange sea safaris, or a cross country ski across the peaks of the fjords where there’s almost always fresh snow untouched by human activity. Price from £1,650pp for 3 nights. Find out more here. Valentine’s Day in Finland is uncommercial and celebrates friendship rather than romance, but that doesn’t change the fact that the stunning views lend themselves perfectly to a romantic atmosphere. Beana Laponia Wilderness Boutique Hotel is the perfect resort for a romantic break, with beautiful, individually decorated rooms, and selection of exciting outdoor activities. A working husky farm and small boutique hotel, the Beana is deep in the Finnish wilderness, with the Northern Lights visible quite often from the end of August to the end of March – perfect for Valentine’s Day. From husky safaris, to a reindeer farm visit, with accommodation that includes a hotel sauna and jacuzzi, this hotel is the perfect way for enjoying quality time with your love in romantic isolation. There’s also the opportunity to travel north towards the Arctic Circle into the magical Lapland, a snow and icy corner of the world. Get there in style, by ice driving across the frozen lakes. Price from £1,600pp for 4 nights. Find out more here. 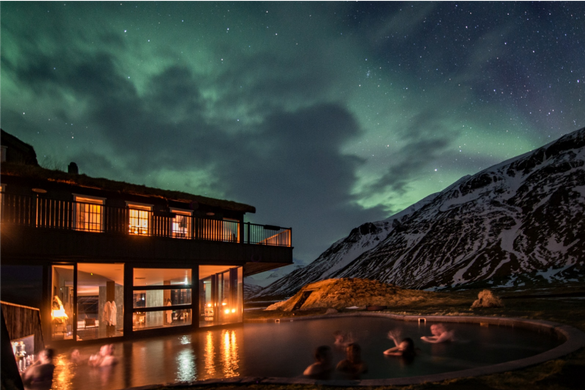 Reykjavik is known as the ‘Paris of the North’, and just like Paris, Reykjavik – and the rest of Iceland, is the destination of love, and the perfect place for lovebirds. The Blue Lagoon Retreat Hotel, a spa hotel with direct access to the Blue Lagoon from your room, is the perfect destination to celebrate your love for your partner, without having to head out on any major excursions. The fact that the idyllic Blue Lagoon is right outside your door means you get to escape the crowds, and just focus on celebrating the day in the most romantic way possible. The hotel includes a retreat spa, which promises to transport your mind and body to new dimensions of peace and rejuvenation, as well as a fine dining experience which combines tradition, innovation, purity, and freshness. Not content with soaking up the relaxing atmosphere? You can also head out in super-jeeps and take in the majestic landscapes of the country, and if you’re lucky you might even find yourself under the colours of the northern lights. Price from £3,000pp for 3 nights. Find out more here. Find out more about all of True Luxury Travel’s new European offering online or by contacting the team directly.